Just a few years ago, light bulbs were simple light bulbs. There’s hardly any variety of light from which you can choose the perfect one for your living space. Whenever, it comes to interior lighting, the only choice left with you was heading to a store and pick up some incandescent bulbs. Quite obviously, people used to look at the wattage of the bulb for determining its brightness. However, with the passage of time technological advancements have brought us CFL and LED lighting solutions. The new options are considered more energy efficient and can last for years. But, the research on lighting technology has revealed that LED are the best kind of product as they come with the highest level of energy efficiency and lifespan. So, it’s quite evident that over the years, advances in technology have brought a series of inventions. To know which kind of light reigns supreme, it’s important to dig in. There’s many variables which come into play, but, we would essentially focus on the brightness, lifespan and pricing of each alternatives to do the comparison. To determine the brightest alternative among the available three, it’s important to understand the technology. Actually, brightness is essentially determined by lumen and a difference in the lumen output can affect the brightness of a light. Though, CFL and LED have mostly the same lumen output, but the energy used for generating that output varies widely in case of CFL and LED. However the modern LED generations are coming up with a series of advancements and the little light-emitting diodes (LED) are surpassing CFL in terms of energy consumption, colour and a lot many other things. Additionally, the LED come with zero glare and flickers, which makes it good for health as well. In terms of maintaining light levels and proper rendering, there’s no match to the LEDs. Moreover, LED are becoming more competitively priced with the increase in their demand. Incandescent bulbs, however work totally different from the CFL and LED. The electric current is passed through along a filament made of a long, thin piece of tungsten metal. The filament must be heated adequately before it emits a white-hot light. But in this process, only 5-10% of the electricity is transformed into visible light, while the rest is converted into heat, thus eventually increasing the temperature of a room. There’s a basic difference between lumen and wattage. Brightness of a bulb is not exactly determined by Watts. Instead the Watts determine energy usage of the bulb. Considering this aspect, experts have found that a LED bulb with wattage of 8 can produce 400 to 500 lumen output, while a CFL bulb requires 9 to 12 wattage to produce the same quantity of lumen output. In case of incandescent, the wattage requirement is about 40. The lifespan estimation of the LED is certainly higher than the other alternatives. A modern LED in advanced technology lasts for 25,000 hours, while the longevity of CFL is 8,000 hours on an average. On an average an incandescent bulb could last for 1,100 hours. 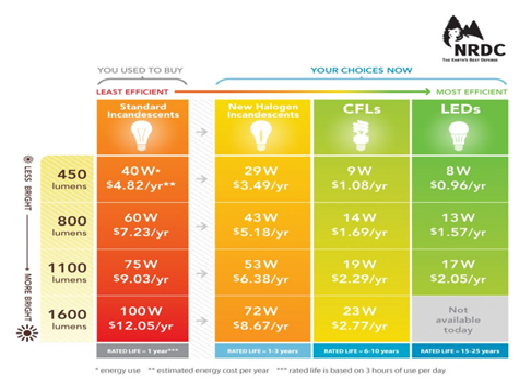 To examine the cost comparison in detail, let’s take an example of a standard 40-watt incandescent bulb. It might cost you a lot lesser than the standard LED and CFL. But, considering it’s energy usage, you might need to bear a huge energy bill every month. On the contrary, investing on the LED can cost you a little extra initially, but it will cut down your energy bill significantly. So, from this perspective investing in the LED lighting solution is the ideal solution for households. No doubt, a new age LED bulb can give a tough competition to the CFL and incandescent. Although, an expensive option, LED offer great benefits in the long run. How Do We Save Money With LED?